The extraction behavior of Nd(III) and Eu(III) with 0.05 mol dm−3 furosemide in benzyl alcohol as single acidic extractant and then with equimolar (0.05 mol dm−3) synergic mixture of furosemide as acidic extractant and tribenzylamine as neutral donor in benzyl alcohol has been studied from aqueous solutions of pH 1 to 6. The effect of various parameters and of various cations and anions on the extraction of these metal ions was investigated. The composition of the extracted adducts was determined by slope analysis method that came out to be [(M(FS)2)+ (CH3COO)−] and [M(FS)3·3TBA] where M = Nd(III) and Eu(III). 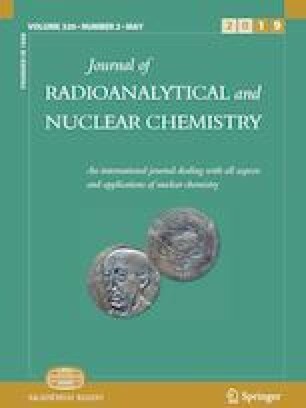 We are grateful to the reactor operation group (ROG) of PINSTECH Islamabad, Pakistan for irradiating the target samples in the research reactor for the production of radionuclides used in this study. We are also grateful to Higher Education Commission, Pakistan for providing financial support to complete this study.